Greetings to you in the name of our Lord and Savior Jesus Christ. We are glad to share with you what God is doing here this month. We hope you’re doing well by the grace of God. “How then will they call on Him in whom they have not believed? How will they believe in Him whom they have not heard? And how will they hear without a preacher? How will they preach unless they are sent?...” (Romans 10:14-15). In our evangelism this month, we have been joined by Mrs. Scovia who has been part of this church. Although we had hardly been with her in the field of evangelism, in these recent months she has been with the team. She is one of the members who have been living in this community for more than 50 years and had been involved in the worship of Satan for many years with her family members. She has had some scary scenarios where she was practicing witchcraft, and spending all her money in satanic worshiping. She normally shares her experience with people we meet while we are sharing the gospel. We are always left amazed at the grace that God shows sinners who have been estranged from Him. She is now a strong member of the church and she loves being part of the church activities. Recently she brought 20 pavers for the church. Due to the fact that we are surrounded by big number of people who believe in witchcraft, many people who hear her testimony have given their lives to Jesus (some people fear giving their lives to Jesus, thinking demons will kill them.) If you read our last month's report, you saw pictures of local herbs we burnt at Hariet’s home. She gave up those herbs after hearing the gospel and Mrs. Scovia’s testimonies. This takes us back to the text of the month, how can they hear unless a messenger is sent to them? Friends, the Lord Jesus is working in the hearts of people in the way even us preachers can’t understand or describe. As a church we are still working on the paving, and on the left are the pavers we bought yesterday. Fred, who is in charge for the logistics of the church did the buying from Kampala. He is such an industrious man. We are hoping these will be enough to finish the remaining part. We will then need cement to finish the work. Preparations are going on well with our pastors in partnership with the CHRISTIANITY EXPLORED MINISTRIES conference. We had a meeting with a few of them to plan a way forward for the conference and to give them letters to invite others. We are expecting fifty pastors at the three day conference. We will be providing accommodation and food for them for three days. The conference will be in Kamengo. Simon and I, with the volunteers from the church, are working hard towards it. We continue to ask you to consider praying for us that we will have one or two conferences each year as a ministry. 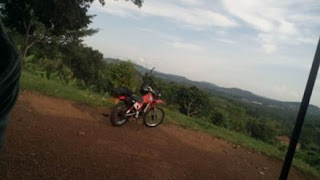 On the right is a picture of our motorbike in the village where we are doing God’s work. I had to drive at night after the meeting, but the motorbike could not start. I ended up leaving late and reaching home at mid-night. Those are the kind of villages where we go to share the gospel. 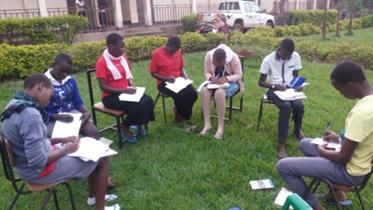 Schools in Uganda re-opened this month, and our youth ministry has started. We enjoyed the break time we had. Christianity Explored Ministries discipleship programs are going on well. 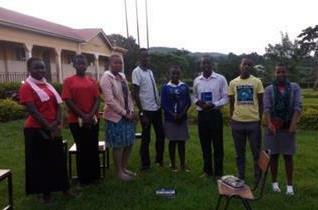 The pictures below are St. Johns youths in the Christianity Explored discipleship program. We were joined by Jackline (below, in the middle with long pink leggings), who comes from Tanzania and is doing her studies at St. Johns high school. She comes from a Seventh Day Adventist belief (S.D.A). When she heard about this discipleship program from a fellow student, she came to me and asked if she could join. And she is now part of us. You know that our joy is to see such people joining with us to hear the true doctrine which transforms their souls for Jesus. 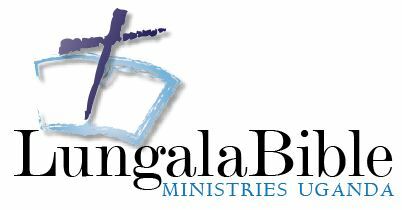 This month we have opened Christianity Explored Ministries in Luganda here in our village. We had seven attendees. We had people come from Roman Catholic Church and others were from Lungala Community Bible Church. We hope to have a group of ten people. We ask you to keep this ministry in prayer. This year we will have a graduation of youths from Christianity Explored Ministries. 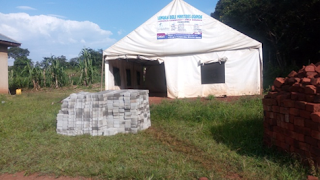 We thank God for providing transport, as it was becoming harder for us to move to different schools and villages to run this ministry. Alex and Simon here in Uganda-Africa. Here comes the month of June!! !